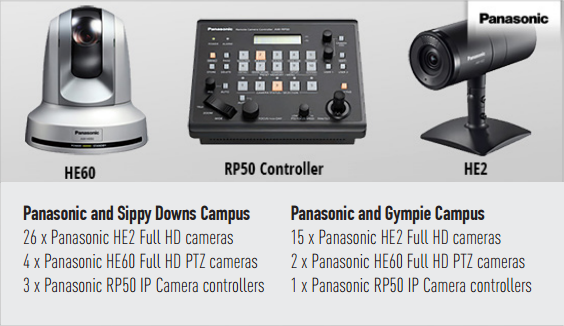 A wide range Panasonic AW-HE2E and AW-HE60 integrated cameras have been used across the simulation spaces in both the Sippy Downs and Gympie campuses as part of this world-class installation. The cameras use IP commands as well as serial commands which allows for control protocols to be easily integrated into the network. They also allow for simultaneous HD video out and IP streaming out so the video feeds can be monitored on traditional displays or on PC/tablets which makes them a flexible camera for multi-site campuses that are a distance apart from each other. What is a Nursing Simulation Space? It’s a simulated hospital environment, designed to engage nursing students in a range of artificially created events that mimic the cases they are likely to encounter in a real hospital environment. ‘Sim’ labs allow students to make clinical decisions without placing themselves or their patients in jeopardy, while still gaining the confidence and competence required to become valuable medical professionals. The University of the Sunshine Coast is well known for implementing new technologies, resources and learning spaces in innovative formats. The USC Nursing Simulation Spaces across the Sippy Downs and Gympie campuses features state-of-the-art technology which will enables enhanced simulation and immersive experiences for students. This technology is at the cutting edge of simulation pedagogy in nursing, midwifery and other programs and it ensures that immersive and innovative teaching methods will remain at the forefront of USC’s learning and teaching agenda. InDesign implemented a dedicated data network to transfer AV signals throughout the sim labs. HDBaseT transmitters send AV signals uncompressed across the network, resulting in superior Full-HD images. Touch screens were installed in the control rooms for effortless switching between inputs and outputs with no lag times. Both of these features make student simulation assessment easier and less ambiguous. Additionally, the content also looks significantly better when shared to other teaching spaces that have HD projectors.